From Romantic Castles and Palaces, As Seen and Described by Famous Writers, edited and translated by Esther Singleton; New York: Dodd, Mead & Company, 1901; pp. 375-379. 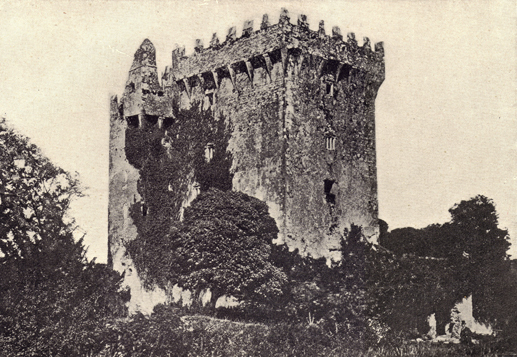 It is certain that to no particular stone of the ancient structure is the marvellous quality exclusively attributed; but in order to make it as difficult as possible to attain the enviable gift, it had long been the custom to point out a stone, a few feet below the battlements, which the very daring only would run the hazard of touching with their lips. The attempt to do so was, indeed, so dangerous, that a few years ago Mr. Jeffreys had it removed from the wall and placed on the highest point of the building, where the visitor may now greet it with little risk. It is about two feet square, and contains the date 1703, with a portion of the arms of the Jeffreys family, but the date, at once, negatives its claim to be considered the true marvel of Blarney.1 A few days before our visit a madman made his way to the top of the castle, and after dancing around it for some hours, his escape from death being almost miraculous, he flung this stone from the tower; it was broken in the fall, and now as the guide stated to us, the “three halves” must receive three distinct kisses to be in any degree effective. The age of the song has been satisfactorily ascertained; it was written in the year 1798 or 1799, by Richard Alfred Millikin, an attorney of Cork. The author little anticipated the celebrity his lines were destined to acquire; they were composed to ridicule the nonsense verses of the village poets, who, with a limited knowledge of the English language, and a smattering of classical names, were in the habit of indulging their still more ignorant auditors, by stringing together sounds that had no sense, but conveyed a notion of the prodigious learning of the singer. Millikin’s song has been injurious to Ireland; it has raised many a laugh at Ireland’s expense, and contributed largely to aid the artist and the actor, of gone-by times, in exhibiting the Irishman as little better than a buffoon — very amusing, no doubt, but exciting any feeling rather than that of respect.